With an individuality remarkable in 20th century art, Lucebert (1924-1984) first became known as the poet of the COBRA movement (1948-1951). His work is distinguished by the predominance of drawing, which he practiced on a daily basis his entire life. With close affinities to Surrealism and Art Brut (Primitive Art), Lucebert's work displays the freedom and fantasy that characterize the COBRA movement. All of his work reflects his obsession with man and the human condition, a theme that he painted with fear, violence and uncertainty, but also tenderness and humor. In this same way, in his paintings figures appear, are transformed, and linked to visual associations of great power. Lucebert possessed a great natural gift for painting and drawing. Lucebert's works are included in the Museum of Modern Art, New York; Guggenheim Foundation, New York; Tate Gallery, London; Stedelijk Museum, Amsterdam; Musees de Rotterdam, Eindhoven, Gent, Stockholm, Anvers, Munich; National Gallery of Ireland, Dublin; Museum of Art Fort Lauderdale, Florida; Museo de Belles Artes, Mexico City. Chronology: Lucebert was born in Amsterdam in 1924, where, in 1938, he began his studies at the Institute for Arts & Crafts. In 1949 he took part in the first exhibition of the COBRA-group in the Stedelijk Museum, Amsterdam. Lucebert combined poetry with painting in the eight books he made during the years 1949-51. These works were all published in publications relating to COBRA or to Dutch experimental art. In the 1950´s, strongly under the influence of COBRA, Lucebert directed his creativity more and more to painting while continuing to work on his poetry. In 1954 received the prize for literature of the city of Amsterdam. Continuing to combine his two arts, in 1955, at the invitation of the poet and playwright Bertoldt Brecht, he lived in East Berlin and traveled in East Germany and Bulgaria. In 1959 he was awarded the "Mediterranean Prize" of the Paris Biennale. He made his first etchings in 1960. In 1962 he won the 2nd "Marzotto Prize"; in 1964 he was awarded the "Carlo Cardazzo" prize at the 32nd Biennale in Venice, Italy. In 1965 the filmmaker J. v. d. Keuken maked a color movie entitled "A film for Lucebert" and Lucebert received the "Constantijn Huygens Prize" for his poetry. In 1968 he was awarded the highest Dutch Governmental prize for literature, the "P.C. Hooft Prize." 1969 saw the premiere of his experimental theater-production, Popetgom, in The Hague and Amsterdam. It was also broadcast on Dutch television. In 1974, an edition of all his poetry, complete with a critical commentary, was published. During this time, Lucebert lived and worked in Spain and Rome. In 1983 Lucebert received the "Dutch-Belgian Prize" for Dutch literature. In 1986, the Stedelijk Museum in Amsterdam, home to some of the world's greatest Dutch paintings by artists like Rembrandt and Vermeer (as well as major collections of conntemporary paintings), purchased a collection of 873 of his paintings, drawings, and prints. Selected Bibliography: W. A. L. Beeren and Ad Petersen, Lucebert in the Stedelijk / Lucebert in het Stedelijk (Amsterdam: Stedelijk Museum, 1987: 157 pp., 90 illus. including 16 color plates; over 800 paintings, drawings, watercolors, and prints pictured in thumbnail illus. in the Catalogue Raisonne section; this is the major work in English on this important Dutch painter and founding member of the COBRA movement); J. Eijkelboom, Art & Architecture in the Netherlands: Lucebert (Amsterdam: Meulenhoff, 1964); Jens Christian Jensen, Lucebert (Kiel: Galerie Sfeir-Semler, 1986); Kunsthalle, Kiel, Der junge Lucebert. Gemälde, Gouachen, Aquarelle, Zeichnungen, Radierungen, 1947 bis 1965 (Kiel: Kunsthalle, 1989); Jean-Clarence Lambert, Cobra (NY: Abbeville Press, 1983); Dietrich Mahlow, Lucebert - Zeichnungen und Gouachen aus der Sammlung C. A. Groendijk (Baden-Baden, 1964); Christoph Meckel, Ernten im irrgarten. Neue Gedichte und Zeichnungen. Mit einem Guten Morgen Lucebert von Christoph Meckel: Niederländische Literatur der Moderne 1 (Münster: Kleinheinrich, 1990); Stedelijk Museum. 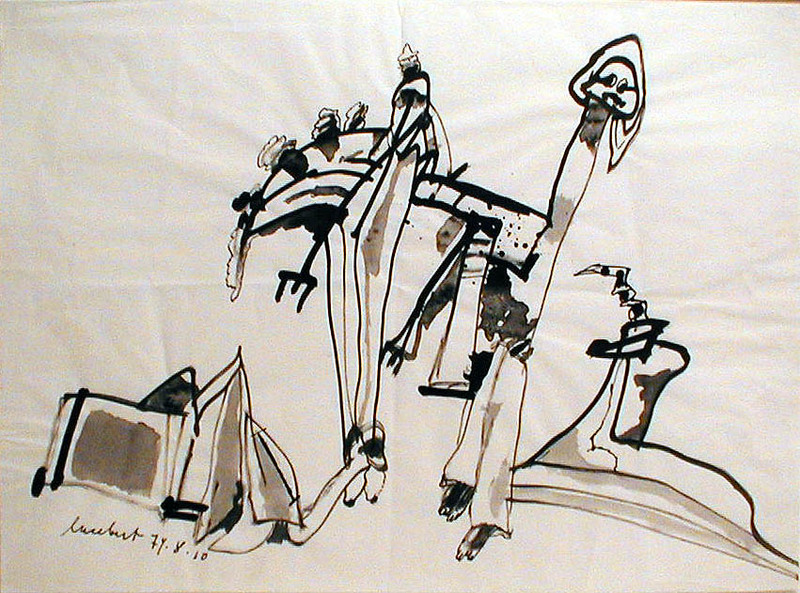 Lucebert: Schilderijen, gouaches, tekeningen en grafiek (Amsterdam: Stedelijk Museum, 1969). Untitled. Pen and black ink on paper, 1974. Signed and dated 74.8.10. Lucebert was both a poet and a painter. One of the original COBRA group, he participated in several of the group shows and in many individual ones. Lambert describes him as the "demiurge" who created a "carnival of infernal and celestial beings." Image size: 338x467mm. Price: $7500.